A couple of years ago, I came across this photo on eBay. It’s small — maybe about 2×3 inches — pasted to a blank postcard. On the back, in pencil, it says, “Lou Gehrig and [illegible] 1927 Ashbury Pk.” The illegible name looks like Janu, but it could be anything. I suspect it might be the man in the dark suit directly behind Lou. It was taken outside the Berkeley-Carteret Hotel the day Lou and Babe Ruth came through with their barnstorming tour in October 1927. The game was delayed an hour because William Truby, the promoter, failed to produce the $2,500 cashier’s check that he had promised. Walsh always demanded money up-front, with paydays ranging from $1,000 to $2,500, depending on the size of the town and the expected crowd. If receipts from ticket sales went beyond a predetermined level, he and his players would also receive a percentage of the gate. When a local politician offered to write a personal check for the $2,500 so that the game might begin, Walsh rejected it, saying only a cashier’s check would do. He and Gehrig and Ruth went to the Berkeley-Carteret Hotel to wait. 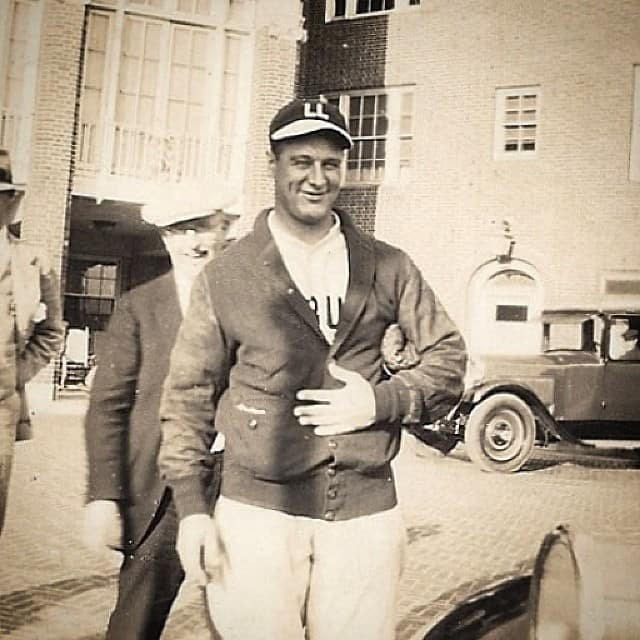 When the cashier’s check finally arrived, Gehrig pulled a cardigan sweater over his baseball jersey, tucked his mitt under his left arm, and walked out of the hotel into the afternoon sun. Outside, cars were waiting to drive the men to the ballpark. It’s quite the record of one day in a legend’s life, when he came to New Jersey.